ATLANTA, Georgia (CNN) -- He's pregnant. 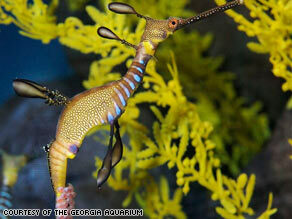 This male weedy sea dragon became the third ever in the U.S. to become pregnant outside of its habitat. After setting the mood with lighting and finessing, the Georgia Aquarium's attempts to coax rare sea dragons to mate have finally worked -- just in time for Father's Day. The pregnant male weedy sea dragon is now only the third of its kind in the United States to successfully become pregnant outside of its natural habitat. The sea dragon, found in nature only in the waters off southern Australia, became pregnant Tuesday when a female transferred her eggs onto his tail. Dennis Christen, assistant manager of animal care and husbandry, said that male sea horses, sea dragons and pipe fish all carry the eggs instead of the female. Christen said that recently the staff took steps to try to assist in mating. They altered the mood by adjusting the lighting and thinning the plants, Christen said. Of the 70 small pink eggs wrapped around the male's tail, nobody knows how many are viable and could actually hatch. Christen said that they are relying on other experiences with breeding, where about 60 percent of the eggs survived, to estimate how things may go. At the Georgia Aquarium, children and teachers were abuzz about the pregnant dragon and circled around the tank trying to pick it out. When the eggs hatch, Christen said they will essentially be miniature versions of the adults. And unlike many animals the weedy sea dragons will not spend their first days, weeks and months shadowing their parents to learn. The eggs are expected to hatch in four to six weeks.